The Bellefonte Historical Railroad Society owns two Budd RDC-1's, 9153 & 9167, and a short section of track in Lemont, PA. We are currently attempting to resume operations and expand our facilities. We regularly host Fall Foliage runs and Christmas trains with an occasional summer run as well as some local activities with speeder cars whenever possible. Please check our website - BellefonteTrain.org - for up to date information. 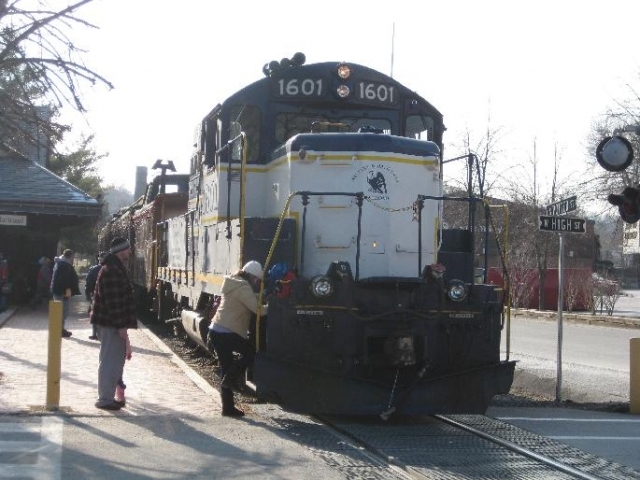 Our meetings occur on the first Monday of every month at the Train Station in Talleyrand Park, Bellefonte, PA and the public is encouraged to attend. We have a monthly work party the second Saturday of every month. Any changes to this schedule are posted on our website. In order to participate in a work party one must be an official member to be covered by our insurance policy. NBER engine heading up an excursion run.